(From right to left) Senior Adviser, Downstream & Infrastructure to the Minister of State, Petroleum Resources, Brenda Ataga, Executive Vice Chairman, Techno Oil, Nkechi Obi; General Manager, Gas, PPPRA, Olasupo Agbaje and Managing Director, Techno Oil, Tony Onyeama during the inter-ministerial team inspection of Techno Oil LPG Cylinder Manufacturing Plant in Lagos on Wednesday. Lagos, June 13, 2018 A 15-member Federal Government Inter-ministerial Team on Wednesday inspected a landmark LPG cylinder manufacturing plant built by Techno Oil Ltd in Lagos, ahead of its inauguration. Ataga, who lauded Techno Oil for its initiative in building the plant, said that the petroleum resources ministry was doing everything possible to make Nigerians to embrace LPG. Similarly, a representative of the Standards Organization of Nigeria (SON), Mrs Nwaoma Olujie, commended Techno Oil for building the plant. She noted, however, that SON would never relent in ensuring that set standards were strictly followed in the deployment of facilities. Olujie said that it was necessary for indigenous companies to venture into manufacturing of facilities needed by Nigerians to discourage importation of fake products into the country. 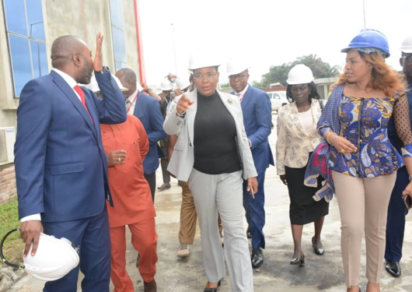 The Executive-Vice-Chairman of Techno Oil, Mrs Nkechi Obi, expressed her happiness with the team for taking off time to inspect the plant, remarking that “seeing is believing’’. according to her, has spurred many indigenous companies to think outside the box. Techno Oil, which opened shop in 1997, has been a pace-setter in key sectors of the economy, including power, lubricants manufacturing, fuels distribution and real estate, among others. The company was nurtured to greatness by a dynamic team of young Nigerians, led by Nkechi Obi, an economist, Mr Tony Onyeama, an engineer and Mr Collins Onyeama, a development expert.